Dieses freistehende Ferienhaus empfängt Sie mit einem Garten mit Gartenmöbeln inmitten von viel Grün im Zentrum von Salzburg. Sie wohnen einen 15-minütigen Spaziergang vom Salzburger Dom entfernt. Die Privatparkplätze an der Unterkunft stehen Ihnen kostenfrei zur Verfügung. WLAN nutzen Sie in der gesamten Unterkunft ebenfalls kostenfrei. Ihre Unterkunft umfasst eine Küche mit einem Geschirrspüler. Ein Wohnzimmer mit 2 Sofas und einem Flachbild-TV sorgt für zusätzlichen Komfort. Handtücher und Bettwäsche werden im Binderhäusl gestellt. Zu den weiteren Einrichtungen der Unterkunft gehören Grillmöglichkeiten. Wir waren insgesamt 5 Frauen, haben uns sehr wohl gefühlt. Der "tierische Besuch" hat uns sehr gut gefallen. Die Einrichtung und Ausstattung des Ferienhäuschens lässt keine Wünsche offen. Schlüsselübergabe etc. verlief reibungslos. In sehr idyllischer Lage. The Binderhausl worked great for our family of 5. Christof was very helpful. And we enjoyed our time in Salzburg. This was the perfect place to stay in Salzburg! We loved the house! It is set quietly away from the bustle of the city, but close enough to walk. The owner, Christof is very kind and we felt very welcome. This is the perfect place for a family. We were traveling with 6 which the only part with that amount of people is the one bathroom, but we got by. 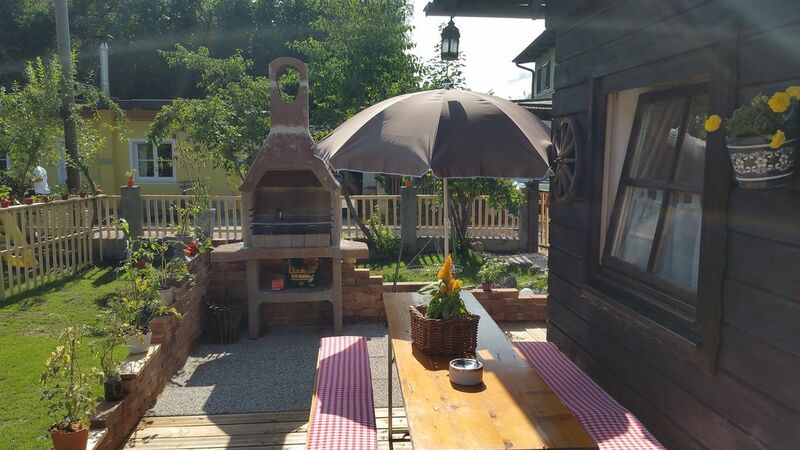 I would recommend this property to anyone that wants to travel to Salzburg! Nice home just outside the city. Hosts were friendly and welcoming. Great place to stay in Salzburg! The house worked great for us in Salzburg! I loved that we were able to do laundry and make some meals there. This was an good place for our family to stay in Salzburg. The owner spoke excellent English and was extremely helpful. He lives next door and was there when we arrived to show us around, and he was happy to call a taxi for us when we left since we do not speak German and we needed a big taxi, not a normal-sized one. The house was a small space for our family, but it was fine for the limited we spent there (we were sightseeing most of the time). The 2 bedrooms were small but fine. Two double beds were in the living room, and the room got light when the sun came up (very early in July) because of no way to cover the windows above the door. The table in the living/dining room seated our whole family of 7. It was a pleasant 20-minute walk to the striking Hohensalzburg fortress (though steep to climb the hill to the fortress). It was about a 45-minute walk passing over the hill of the fortress and through beautiful Old Town Salzburg to get to Mirabell Palace, where we took a bus tour to the salt mines outside Salzburg, and to the Sound of Music sites in the area, which was great fun. There is a good restaurant for Austrian food very close to the house, and a grocery store is less than 1 km away. We wish we could have stayed another night in this house in Salzburg.